LESS than four decades ago, when there were “no foreign workers around”, I had a noble job. It was mainly about holding a cangkul and sweating the whole day so that Malaysians across the country had vegetables on their plates. As a farmhand in Cameron Highlands, I can assert that I have had a hand in nourishing my fellow countrymen, via the vitamins in the cabbages that I planted. For a paltry salary of RM180 a month (with food and lodging provided), for six days a week, I planted cabbages, harvested and packed them into rattan baskets that were loaded onto lorries. There are many reasons why you should eat cabbage. Its antioxidants protect you against colon, breast and prostate cancers, and reduce “bad cholesterol”. Rich in vitamin K, the plant provides 85 per cent of your body’s daily requirement, boosting bone metabolism and helps fight off Alzheimer’s disease. One serving of cabbage is enough to provide 54 per cent daily intake of vitamin C for you. Okay, enough of cabbage talk. Anyway, I don’t plant it anymore and neither do most of my fellow Malaysians. That’s because foreign workers from Bangladesh, Nepal and Myanmar have taken over. In retrospect, owners of vegetable farms in Cameron Highlands used to rely on young people, especially school-leavers in towns and kampung in Perak and other parts of Malaysia to do the work for them in the 1980s. But nowadays, instead of sweating it out at the farms, the younger generation prefer to chill out at coffee houses at shopping centres with their air-conditioned, perfumed ambience and soft music. Instead of facing beautiful bucolic hills, they would rather spend their days on Facebook. As it is, many who have grown up in concrete jungles haven’t seen a real worm before, and are more familiar with malware worms that infect their computer systems. During my era, the notion of foreign people doing dirty or hard work here had yet to take root in the Malaysian mental landscape. I saw many Orang Asli in Cameron Highlands then but hardly any Orang Asing apart from some sightings of Orang Puteh. Today, more than 11,000 legal foreign workers are up there in those hills, while the illegal ones are said to be twice as many. Anyway, it was fun for me to work in a farm then. No dress code, no office wear and it was okay to work half-naked. No proper toilets, too, as the folks there would dig a hole in the ground to answer nature’s call. No smart phone then, and the nearest public phone was a hill or two away. For lunch, I would eat from a tiffin carrier, while squatting on a mound of earth amid the afternoon heat and flies. Though life was no bed of roses, I had the satisfaction of doing an honest day’s work. Nowadays, things are not like before. The dependence on foreign workers in so many aspects of our lives has led to them playing the role of worker ants in a colony of plantations, construction sites, factories, hypermarkets, hotels, petrol stations and other labour-intensive areas. For many of them, Malaysia has always been a land of milk and honey. They just keep coming, and the thousands of them have now become millions. Even on the sport front, the Football Association of Malaysia is opening the doors to let more foreigners play in the M-League. It is allowing all the teams to field four import players (instead of the usual three) simultaneously in a match from next season. Local professional players may cry foul as this means less opportunities for them, but for the national association, the more the merrier, and more excitement. By the Human Resources Ministry’s estimation, there are 6.7 million foreign workers, legal and illegal, in Malaysia. Mind you, that is more than the population of Singapore, New Zealand, Denmark or Norway. To get Malaysia’s “foreign population” into more manageable proportion, the government, via its 6P programme, aims to reduce the numbers. About 503,000 workers were supposed to be sent back to their countries when the deadline expires at the end of next month. But that is not going to happen as the Malaysian Employers Federation (MEF) wasted no time in asking for a one-year extension, and got it. The MEF argued that the construction and plantation sectors would be badly affected by the absence of foreign workers. The MEF pointed out that previously, fruit, worth RM1 billion, went bad due to a shortage of workers at harvest time. Employers want the government to see the labour issue from their dimension — that the 3D jobs (dirty, dangerous and difficult) are duly accepted by foreign workers but not by Malaysians. You can expect these employers to sing the we-want-an-extension-tune next year, and the next, and the next, to the government unless Malaysian workers stand up and be counted. But don’t expect locals to put up their hands unless Malaysians see that blue-collar jobs are also important to nation-building, or as noble, as when I was holding a cangkul at a farm. 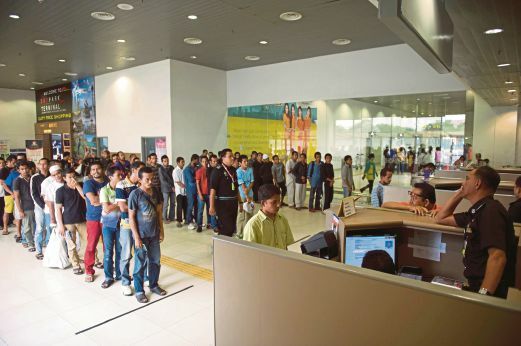 Foreign workers in Malaysia are expected to send back to their countries as much as RM20 billion a year, but on the plus side, their very presence in Malaysia is a real boost to businesses here as they buy things like noodles, bread, soap, clothing, shoes, etc. Telcos are also cashing in on the foreigners’ usage of mobile phones. Inevitably, it has become a symbiotic relationship between local employers and foreign employees as the latter help Malaysia build up the region’s second most successful economy behind Singapore. We do need foreign workers to be part of the economic wheels as Malaysia takes the road to fully- developed nation status by 2020. But we just can’t leave Malaysian workers by the wayside. Just be fair to them, pay them their dues and not sacrifice them for cheap labour and profit. In the long run and in nation-building, our own people are our real assets.